Doctor Yuri Zhivago (1885-1935) was a famous multi-talented Russian doctor. Among his many lifetime and posthumous achievements, he is best known for the Lara cycle of poems that he penned. He is also the person who holds the record for most times seen crying in a film. 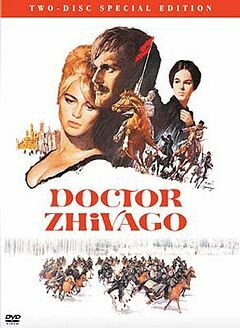 Zhivago specialized in war medicine. He was introduced to this important specialty when he was conscripted into the Red Army as a field doctor. Being a principled egalitarian, he subsequently saw to it that he was kidnapped by the opposing Partisan resistance forces, so that he could help them out as a field doctor and in the process, get even more experience in war medicine. Later, his vast war medicine experience was useful and lucrative for him in terms of consultancy work on the World War I era war movie, "All is Quiet on the Western Front", and its failed sequel "Going For It, Hammer and Tongs On The Eastern Front". He married his stepsister, Tonya, as he wanted her to marry well. He was lover to beautiful Lara Antipova, his co-worker war nurse, in her time of need when she was lonely, and continued the affair with Lara whenever she needed him. One could never fault the considerate Zhivago for caring about others. The 105-poem cycle of Lara poems is Zhivago’s main legacy. Despite stylistic similarities between the poems, scholars of Russian literature are unanimous in their assessment that each extant Lara poem is an original and distinct literary jewel. Virtually all of the poems were written by him during his winter sojourn with Lara at his in-laws' summer mansion at Varikino. Below are two of the best Lara poems, translated into English, and reproduced with the kind consent of Zhivago’s estate. While at medical school, Zhivago was fascinated by the formations of bacteria viewed under the microscope. During the above-mentioned winter sojourn at Varikino, Zhivago noticed similarities between microscopic bacteria formations and the ice crystal formations on the windows of the mansion. Zhivago always loved film. Therefore, it is not surprising that he made an autobiographical documentary film (which he called “Doctor Zhivago”) of his life, featuring his wife Tonya and his lover Lara. More importantly, the film showed his scenic odyssey through revolutionary Russia. His achievements were later recognized by a Cannes Film Festival award in 1920 for Best Travelogue. He went on to posthumously star in the motion picture "Lawrence of Arabia". Zhivago was into fitness before it was even a word. He loved to walk and run, especially during white-out blizzard conditions. He continued this activity even as his health began to fail from his difficult life. He died while running on the sidewalk on a sunny winter day in Moscow. While lying on the sidewalk, before dying, he could be heard muttering the words "Lara, Lara, Lara".